Bangalore: The Indian Space Research Organisation (Isro) is building a smaller launcher that costs 40% less than existing rockets to hurl satellites such as Tecsar and Agile into low-earth orbit. Tecsar is a 300kg Israeli spy satellite Isro had launched in January and Agile a 352kg Italian astronomical satellite launched in April 2007. The three-stage rocket will launch remote-sensing satellites weighing less than 500kg into an orbit that will ensure they return to map a targeted region on earth at more frequent intervals. Low-earth orbit is 400-500km above the earth. The new launcher is targeted at the country’s military as well as global customers. “This (launcher) is for strategic reasons. There is also demand from international customers," said an Isro official, who did not want to be named because of the sensitive nature of the matter. The new launcher would take around six months to build, the official said. In June, the government said it is setting up an Integrated Space Cell to counter a growing threat to India’s space assets, but did not elaborate. The Indian Air Force (IAF)’s first controlled satellite to gather navigational information will be launched in July. The satellite, according to IAF chief Fali H. Major, would serve as the air force’s eye in the skies, ‘PTI’ reported on 18 November. 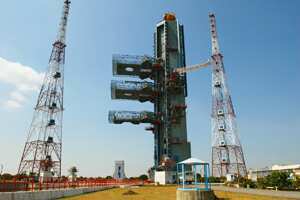 An Isro spokesman said the space agency was working on a different variant of its Polar Satellite Launch Vehicle (PSLV). It currently costs Rs100 crore to launch a satellite on a PSLV rocket. The PSLV, Isro’s workhorse, can launch satellites of 1.3 tonnes into a polar orbit, but in the last two years, stripped-down versions of the rocket carried the lighter Israeli and Italian satellites. “We had to first send it to polar orbit, burn the rocket for long, before we placed Tecsar in the low (earth) orbit," said another official at the space agency. “That (detour) consumed 60% of the energy of the rocket."